It started off simply enough. 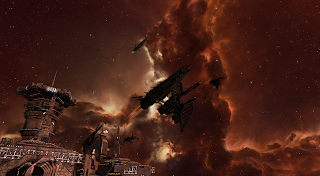 A post on the forums by Altaen announcing a Sunday Afternoon (US EST) roam to celebrate his 4th year in Eve. Celebration fleets are often interesting. They tend to be themed in some way. Whomever is celebrating often will FC or request an FC and set the terms for the fleet and roam. For Altaen, it is Minmatar ships only. 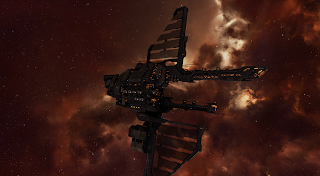 Angel ships (pirate faction) do not qualify and any non-Minmatar ships attempting to join fleet will be killed on the undock and the pilot asked to reship. This warms my heart. It reminds me of my similar rules for the Rawrcat Doctrine in relation to wolves. For any that feel the terms are unfair or exclusive please note that any Minmatar ship is invited. It meant any Minmatara ship all the way down to a Reaper, the free noobship was welcome before any non-Minmatar ship would be tolerated. DP's only request was that Altaen Role Play the Fleet. That didn't happen but Altaen did request pictures. With the fleet terms hashed out, the actual desired ships were listed. Altaen wanted a celebratory fleet of bling ships. Republic Fleet Issue ships would be on the forefront of the request list. Blinged out ships would be even better. I rubbed my chin and smiled. There was only one solution for me to bring to this ship. It was time to undock my Hurricane Fleet Issue and bling it up. 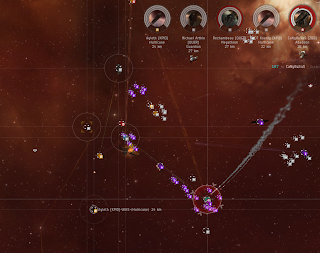 If I died, I would die in a ball of kill board ISK efficiency tanking fire so bright our killboard would momentarily flare into a super nova level event. I giggled. And while my fit may not truly be blinged out for some people for me, it is a first time experience to use shiny modules on my ship. I've firmly pushed against it feeling that my abilities as a pilot and ship loss habits did not equate to the value that the better modules would add to my abilities. However today... today I decided that enough was enough with me and my self confidence issues and for Altaen, I'd sparkle with a bit of swagger. I think this was my first foray into artillery ships. Ever. DP berated me when he found out, because I was sniffing around to make sure I was fitting it in a somewhat reasonable manner, that I had never flown one before. It seems that they were once a thing? I don't know. I've always flown autocannon Hurricanes an I stopped flying regular ones after the nerf. This is my first call for artillery Hurricanes. 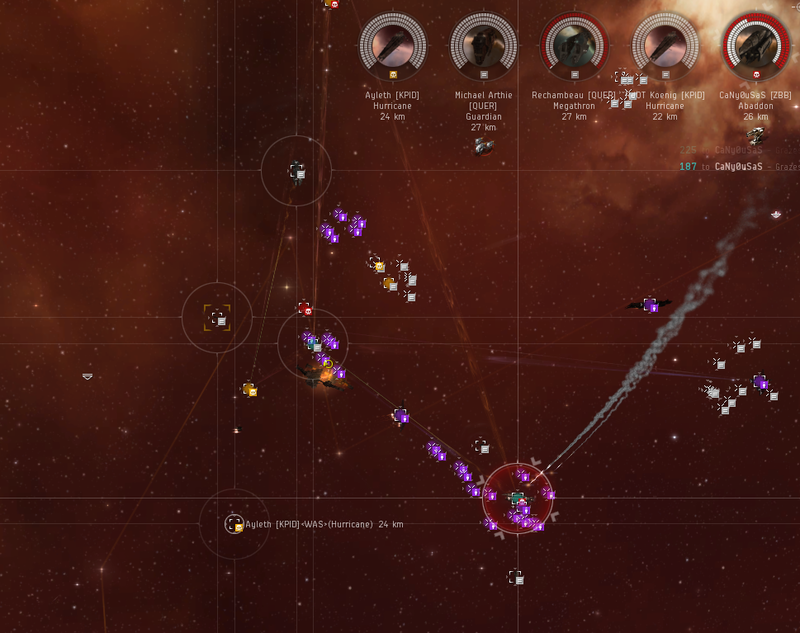 It may make me a failure at Eve but there are many areas of Eve that I am ignorant about. Naoru helped me out and Vov, later, asked if the gyros were worth it. It old him that I had a clue level of zero about that. Then he asked why no faction point. I had to explain that it was just a thing more so than a technical reason. Some shuffling and planning and 25 minutes after the arranged time our Minmatar fleet undocked without any false positives on board. Although there were some suggestions and Altaen had to use his cold voice once when someone almost brought a Merlin. However, the iced chill snapped the poor soul out of his state of confusion and an appropriate ship was changed into. The goal was to visit all of Minmatar Space. Before his fall into darkness, Altaen was a well known and well respected law abiding anti-pirate of the famed Electus Matari. It is truly the fault of the pirates of Molden Heath with Dirty Protagonist and Titus Veridius that caused his fall from grace. Ahh well. The good guys had him long enough. He is ours now and we are very, very fond of him. Jaguar, Scimitar x3, Scythe, Scythe Fleet Issue, Sleipnir, Stabber Fleet Issue, Republic Fleet Firetail x2, Tempest Fleet Issue x3, Tempest x2, Typhoon, a Vigil, and my Hurricane Fleet Issue. Over the course of the night the composition would change. We'd lose some Tempest Fleet Issues, gain a Typhoon Fleet Issue, have another Hurricane Fleet Issue, be visited by Stilettos, have a Rupture transform into a Hurricane and in general have fun as people joined in when and where they could. We swung around the loop and when we hit Aedald we wound up engaging a gang. The initial thought was that they were going to bail as they re-approached the gate and we engaged on the gate. I forgot I was flying an arty cane and I should have pulled range once we decided to engage on the gate. I am very rusty at flying Hurricane's and I flew I went down after two of the Tempest Fleet Issues.It was a beautiful battle even if I went down halfway through. So many Brutix at zero. In the end we lost 2 Tempest Fleet Issues, a Hurricane Fleet Issue, a Scimitar and x2 Republic Fleet Firetail. They lost Brutix x6, Harbinger Navy Issue, Hurricane x6, Blackbird x2, Vexor, Prophecy x3. I swung out to reship into a Jaguar but I did not make it back in time. We held the field. Our shiny wrecks were looted and the shiny modules sent back to station. Only one of my Republic Fleet Gyros dropped. 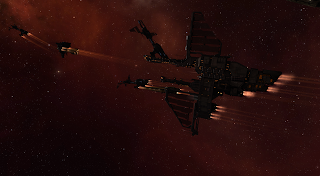 This is one of those moments when someone might go, "well they won the ISK war" or that it was very close. I could never judge a fight like this based off of ISK. Especially when we were out in shiny ships just to be out in shiny ships. It is a reminder that people will not always know what other people are doing and why. I reshipped into my other Hurricane Fleet Issue, this time autocannon, and off we went again. A bit less shiny but still 100% Minmatar. Our next segment was a swing down into null sec. Not a place I spend a lot of time in. 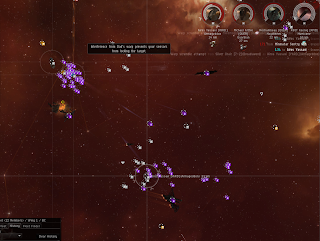 We ran into the dude that likes to run around and bomb fleets that go through null. Damage Control and Invul on. Small chance we could kill something on the station. It was worth the shot to swing by and shoot at them. 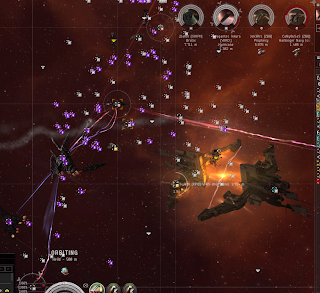 They docked and undocked carriers and the guy in his bait Rapier baited and surprise, bombers as expected considering local was tickling up and up. Sitting through a bomber run is uncomfortable. The fleet was spread, no one had their MWD on and we were moving towards an align point. They did their bombing run and we absorbed the damage. Our logistics ships repped us. I shivered a bit. We tried to pop bombers. They killed absolutely no one. It is a strange feeling, sitting through it. It is also a satisfying feeling sitting through it and knowing that they didn't get their cloaky bombing thing on. Bombers are one of those things that I'm a bit sketchy on. The sit cloaked and hope to bomb people part does not appeal to me. I wind up feeling strange because I watch people get so excited about bombs and bombing runs and I don't feel any of the draw and excitement. They had carrier reps and such so we were not going to be very productive. As we left, one guy accused us of living in Egbinger. Weirdness. But people do confuse people with other people. Back in Bosena we took a break. Some people had to leave so we re-shifted the fleet around got resettled and headed back out. We immediately slammed into a battleship gang on the first gate. It turned out that it was the battle-cruiser gang we had fought an hour before. We did the stand off thing for a while. What happened wound up being amusing. DP was going to reship from a Typhoon to a Tempest. When he jumped they followed him and they had put a tackle ship on the other side. DP then hits his micro jump drive, bounces out of their reach and heads off to the next system. We start to kill the Prophecy they left behind. Just as we are finishing it off their fleet makes it back to the gate. We kill their Prophecy and kill a Hurricane when their fleet warped off. We thought they were doing a tactical thing. In the end we cross jumped each other and we gave chase. As we were about to jump after them a wild polish T3 fleet appeared. We held off jumping, they vanished into the mist (wormhole) we resorted ourselves and chased the battleship gang. We wound up in Aedald. Again and this time the fight went down. They had engaged Sard on one side of the gate. They came through, we had pulled range and this time, at proper combat ranges, into battle we went. Oh yeah. We had a triage carrier on standby this time. Cyno up. And we jumped in a Nidhogger because this was a Minmatar only fleet and we didn't want to break Altaen's immersion. Some of them made it out. In the end we managed to kill their Thorax, Hurricane, Armageddon, Guardian, Abaddon. The rest jumped out or warped off. We cleared the field again, shook ourselves down and regrouped again. I don't think we lost anyone. The killmails are scattered across the mix of our fleet and Eve Kill is slow at catching up to show what actually happened. Its a mess with two fights in the same system involving the same people but it is what it is. We also invited some of the local anti-pirates to fleet. That was a very solid, coldly said, no. Also there seemed to be some irritation with some of the other's who had joined us to celebrate with Altaen, their friend. It rather turns me off of roleplay. But, at the same time I have to accept that they enjoy playing the game in that way just as I enjoy playing it in such a manner that I socialize with the people I like without roleplay. Resorted we finally made our way out of Molden Heath to explore the rest of Minmatar space. That turned out to be a lot of running around and missing engagements. 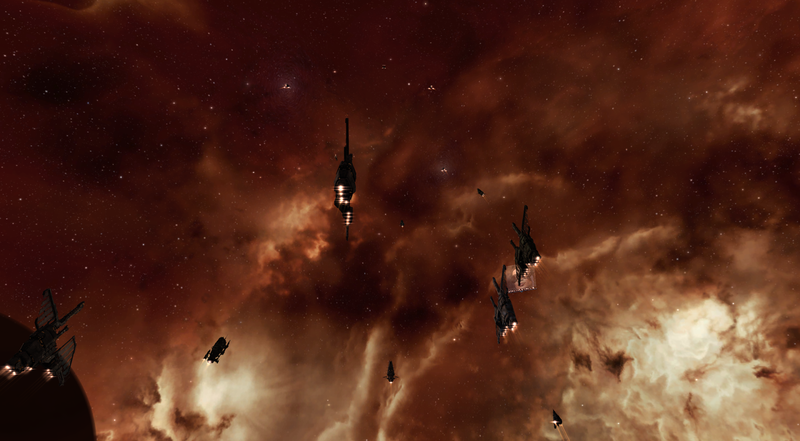 We warped all over Amamake at one point trying to catch various fleets. There were also a lot of wormhole T3 fleets out. Our fleet grew and shrank as people logged in and logged off. We tried to pick a fight with yet another T3 Wormhole corp but it didn't work out. Finally, we headed back home and killed a Hurricane on the way out. I also managed to pounce on an empty Iteron that cross jumped the fleet just as I was landing on the gate. I guess hoping for more fights like the two we had earlier would be greedy. We were out for for just under five hours all told. Long, long roam but a good evening all together. Fantastic write-up, thank you Sugar!